Housing affordability crept down again in the third quarter of 2018 reaching, according to the National Association of Home Builders (NAHB), a ten-year low. The NAHB/Wells Fargo Housing Opportunity Index (HOI) indicates that 56.4 percent of new and existing homes that were sold nationwide during the quarter were affordable to families earning the U.S. median income of $71,000. In the second quarter 57.1 percent of homes were affordable by this measure. Affordability, according to the 2nd quarter reading, is the lowest since mid-2008. The HOI reacted to the combination of a 5 basis point increase in the mortgage interest rate to 4.72 percent over the course of the reporting period, coupled ongoing appreciation in home values. The median price of a home sold during the quarter was $268,000, $3,000 more than the median in the second quarter. The most affordable major housing market in the country was Syracuse with 88.2 percent of all homes sold available to families earning the area's median income of $74,100. It was the second quarter in a row that Syracuse topped the affordability chart. The most affordable small market was Kokomo, Indiana where 93.2 percent of houses were affordable to families earning $64,100. San Francisco extended its reign as the least affordable major market to a fourth quarter. Only 6.4 percent of homes sold were affordable to a median income family, even though that median income was $116,400. All five least affordable small housing markets were also in the Golden State led by Santa Cruz-Watsonville where 6.5 percent of homes were affordable to those earning the area's median of $81,400. 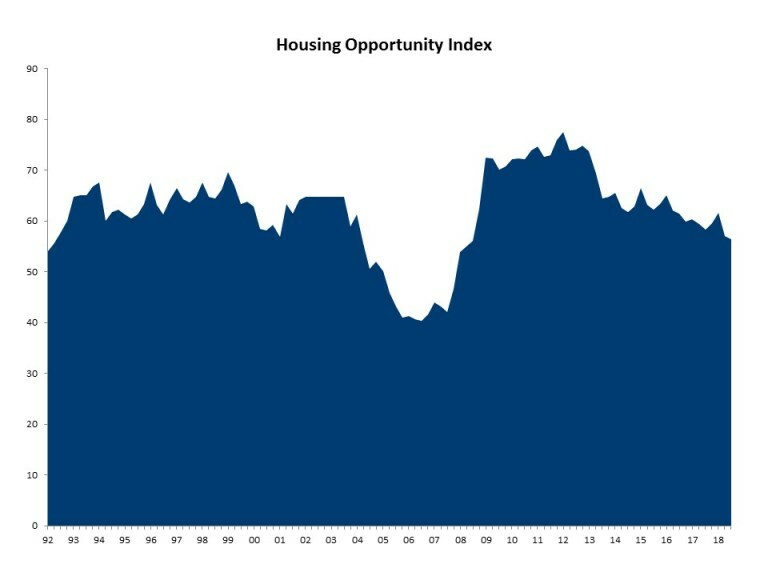 Rose Quint, summarizing the HOI results in NAHB's Eye on Housing blog said, "Overall, housing demand continues to be supported by strong job and economic growth, but affordability is being challenged by price and interest rate increases as well as labor shortages and trade war concerns."